Now that I finished my (probably overly long) New Zealand series, I can get caught up on some Central Asia things I’ve neglected. The first of which, is our return to Shymbulak Ski Resort, and our first real experience with Almaty proper. 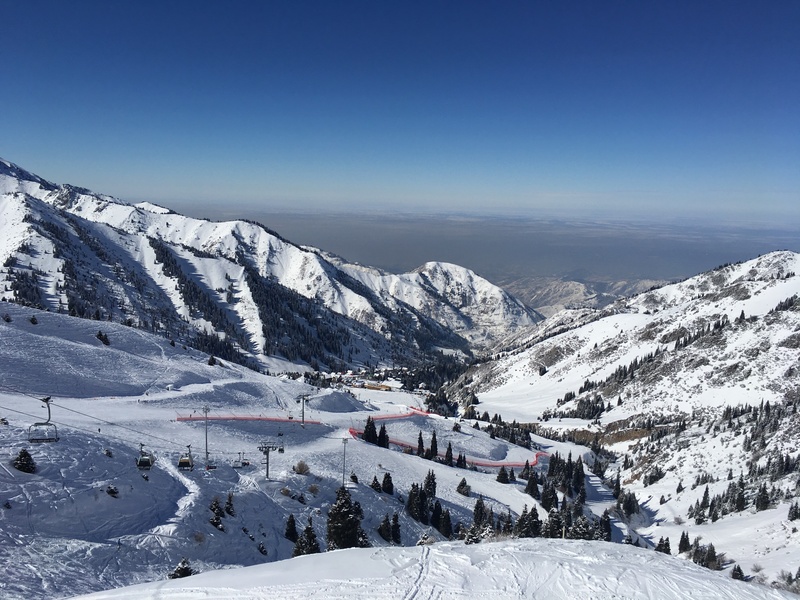 I previously spoke about Almaty about a year ago when we had our first ever CLO ski trip to Shymbulak Resort about 45 minutes outside the city. We had a fun time skiing last year, and a less than fun time in town due to the absence of Kazakh Elvis at Hard Rock Cafe. 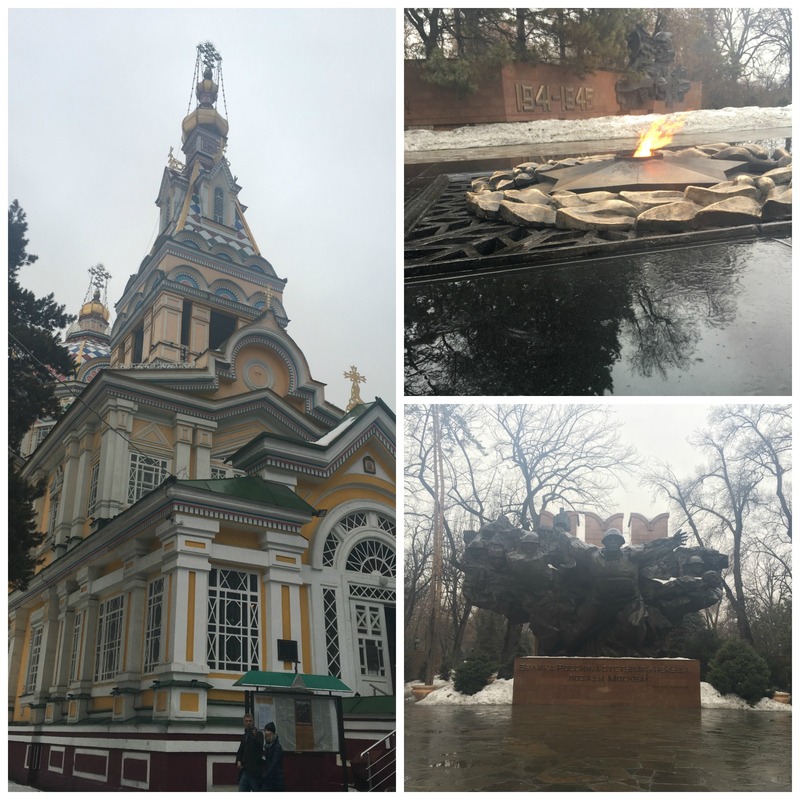 I left with a good feeling about the tiny ski resort, and a sour taste in my mouth about Almaty itself. This time around, things completely reversed. The ski trip was significantly smaller this year than last. Several people, including my co-CLO, were by chance going to be in town that same weekend. The schedule was much less structured and no one really needed any guidance. We also extended the trip a day so we had more time to explore. Our friends knew I didn’t have a good Almaty experience last time and were determined to show me the city could actually be a nice escape from the day-to-day stress in Tajikistan. I was skeptical to say the least. We didn’t do a whole ton of shopping, but just the atmosphere was nice. We were in a Western-style place with European shops and, most importantly, no one was staring at us. In Dushanbe, Westerners are an anomaly and we get a lot of looks. Mostly curious, but after 18 months I’ve grown really sick of the attention. In Almaty, we were mostly ignored. We spent the late morning wandering around the gardens and had lunch at Craft Kitchen and Bar, a great little burger joint that you could easily find in DC. They had good beer. They had good burgers. They had good salad for goodness sake! For the first time I understood why people love this city. After more malls and more wandering, we at dinner ate this trendy restaurant called My Cafe. Psst! Want me to love a city? Serve me good food! It’s pretty simple. After a lovely dinner, we jumped in a taxi to take us to the gondola to head up to Shymbulak. And that’s where it all went wrong. It was Saturday night, and the gondola up to the resort runs until midnight. The alternative to the gondola was a steep, windy, mountain road that was slippery with ice and snow. No thanks. I like living, or at least not vomiting in the back of a taxi. Trouble is, when we got to the gondola – that was clearly still running, people were getting off at the bottom being my first clue – the guard told us it was closed. After going back and forth with him and several people they called the operator at the top who finally confirmed that yes, it would run until midnight. Minor issue, probably, but it made me afraid for the 25 minute ride that the car would stop suddenly and we would spend a cold night suspended above the snowy mountains. We spent the next two days, Sunday and Monday, skiing. I’m not a good skier at all, and Shymbulak is probably right above my ability level. While I can make it down the mountain, each run is a major ordeal and I got less and less confident as the day went on. 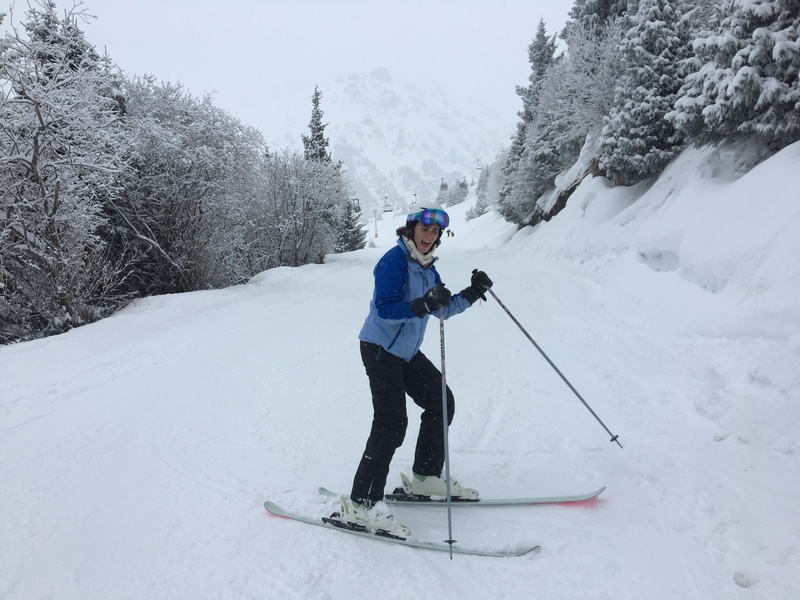 Plus, it was snowing and I was trying to ski in powder for the first time. So. Many. Faceplants. Our friends who convinced me to give Almaty a chance were staying at the second hotel on the hill that night, SnEG. It’s halfway up the mountain and accessible only by chairlift. We – since we were staying at the hotel at the bottom of the hill – decided to eat dinner with them and then either ski or ride down. The chairlift of course stopped running at 6:00 p.m. and the hill had no night skiing that day so we were absolutely not allowed to ski down after dinner. On top of that, the other restaurants at the bottom of the hill closed down so we were stuck eating at the one attached to the hotel. The food was fine, but it would have been more fun to eat with our friends. After our second day of skiing, the same thing happened. Our friends left that night so we had one more day on the hill. Again, everything shut down at 6:00 p.m. so we were stuck at that same restaurant. This time they forgot Sean’s food and didn’t tell him until after I had finished eating mine. Then they had nothing left so he went to bed pretty hungry. In our tiny, uncomfortable hotel room. Not a good way to end our long week. Go ski at Shymbulak, but head back down the gondola at night for a good meal and better hotel in town. You’ll thank me. Where We Stayed: Shymbulak Resort Hotel, Almaty – I don’t recommend this. Where Our Friends Stayed: Ritz-Carlton, Almaty – I do recommend this. 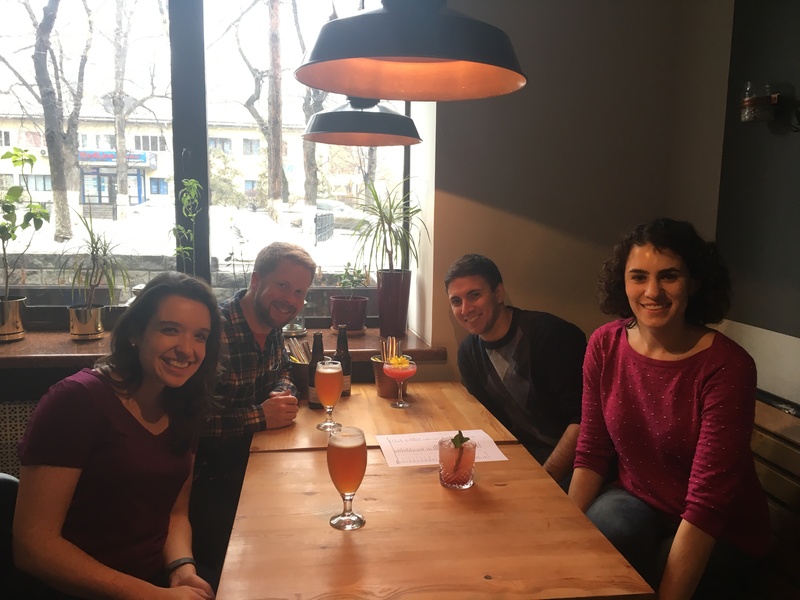 Where We Ate: Craft Kitchen and Bar, Almaty; My Cafe, Almaty; SNeG, Shymbulak; Chalet, Shymbulak; Paul, Shymbulak – when it’s open, this place is amazing for breakfast and lunch. It’s a French chain that can be found all over the world. 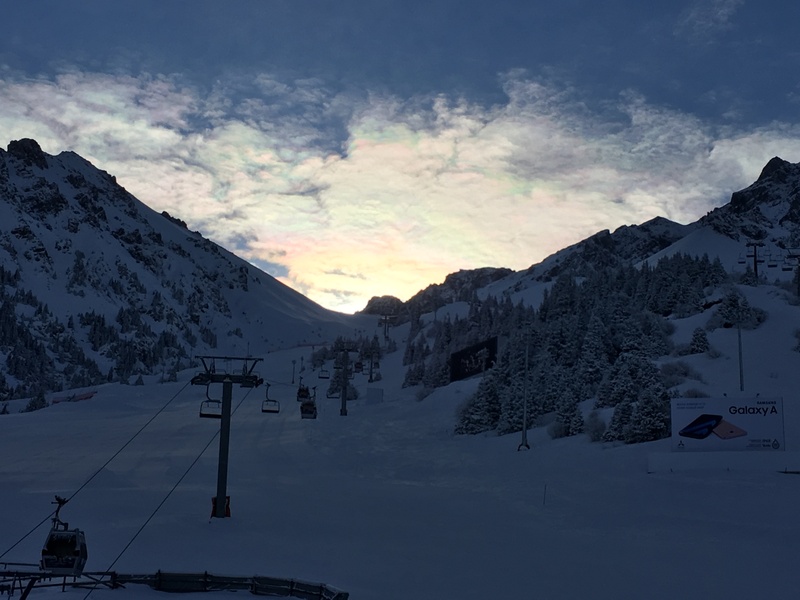 Shymbulak Ski Resort – skiing is generally good and well-groomed. They also have full-service rentals which include jackets and snow pants.